Spinach has many excellent health benefits.Falvaonoid compounds in spinach act as antioxidants and fight against stomach ,skin,breast,prostate and other cancers.Spinach is also extremely rich in vitamin K,which helps to boost bone strengh. Spinach is relatively high in vitamin E content may help protect the brain from cognitive decline as we age.Spinach also keep eyes healthy. I made this Spinach Dal with tomatoes which is called as Paalakura tomato pappu in andhra cuisine. 1. Pressure cook the dal , spinach and tomato for 3 whistles. 2. Heat oil in a kadai,add mustard seeds,channa dal, urad dal,redchilles and add hing . 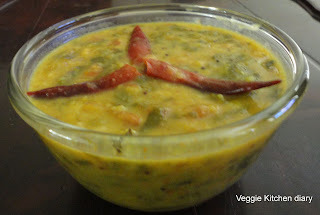 3.Open the pressure cooker and transfer the dal into the kadai. 4.Now add tamarind juice, salt and red chilli powder. 5.Cover and let it simmer for 5 minutes. 6.Serve with hot rice and a dollop of ghee.